I had a friend years ago that ate 100 marshmallow Peeps for a church charity. There was a small amount of people in this church basement, and about a dozen people sat to watch this person stuff his face with the candied chicks and rabbits. He was seated at a table onstage with a bucket handy, in case the chicks wanted to fly the coop. He requested Van Halen’s “Panama” to be played over the P.A. when he was getting tired and/or sick and needed a second wind. This actually worked. On the ride home, laying in the backseat, he said that the street lights were really bright and felt like he was tripping. My job was to go in a drug store and buy him a bottle of ipecac to induce vomiting. When we got back to his house, he spent the next 45 minutes throwing up a stream of glittery, bright pink marshmallow remnants. He was delighted to show off a completely undigested Peep, still in its original bunny shape, that he had picked from the toilet. They come in resealable packaging - unless you prefer your Oreo's by the dozen. It was one of the most disgusting things I’ve ever seen. I’m not sure how much money was raised or why a church would want to take part in this. Now that I think about it, I don’t even think it was for charity nor remember any money ever changing hands. This experience is the first thing I always think of when I see Peeps (or hear “Panama”). Luckily, I never liked Peeps anyway, so this did not ruin my love for them. To me, Peeps were that thing in your Easter basket that you gave to your dog. The Easter-equivalent to a fruitcake. I figured that nobody actually likes these foods, but it’s a holiday tradition. Obviously, there are many, many people who do love Peeps. They’re so popular, in fact, that manufacturers Just Born now sell Peeps for various holidays, graduating from their former Spring exclusivity. They’ve even expanded the line to feature more experimental versions, such as Caramel Apple, Hot Cocoa, and the recent Fruit Punch. 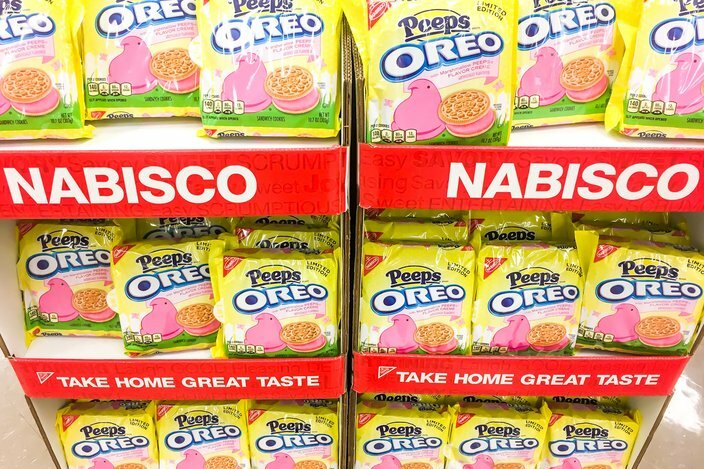 It’s only natural that Oreos, another junk food legend with ever-evolving flavors, would team up with Peeps to collaborate. It’s like a snack food Mega Powers. 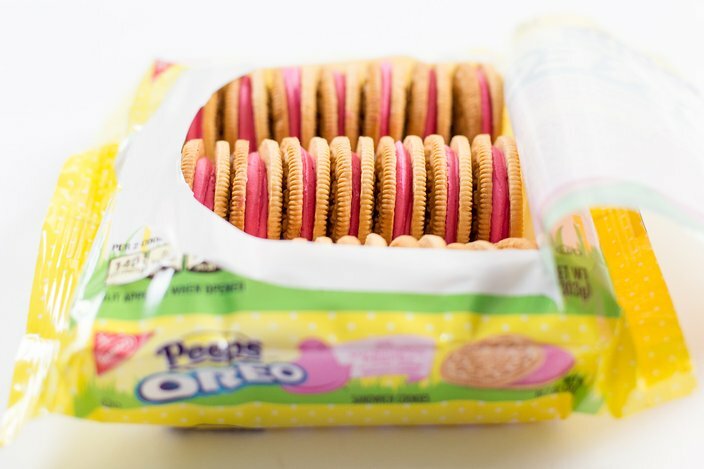 The result is the limited edition Peeps Oreos, featuring vanilla cookies filled with pink, Peep-flavored creme. The biggest takeaway is that it tastes almost nothing like an actual Peep. If you’re a Peep fan, to whom this is clearly marketed, that may be disappointing. 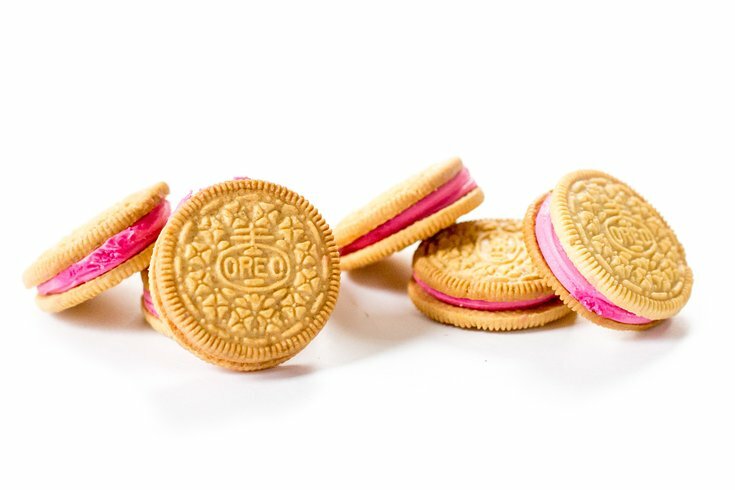 While one might picture a Peep Oreo in their head as featuring a sandwich made with actual squished sparkly marshmallow, the cookie features marshmallow-flavored cream that doesn’t really taste like it at all. It’s very sweet, but the texture and the sticky fluffiness of a marshmallow is so important to the food as a whole that flavored creme doesn’t do it justice. The “marshmallow” creme may have stemmed from the previously released S’more Oreos. While it may fail as a Peep, judging solely based on cookie standards, this is pretty good. I would definitely choose this over an actual Peep. It’s similar to – though not as tasty as – the excellent Birthday Cake Oreos, featuring a spin on vanilla icing. Aesthetically, they look very appealing and Easter-like. However, that appearance apparently comes at a price. Feel so inclined? There's a generously-sized display at the South Philly ACME -- it's near the pharmacy. 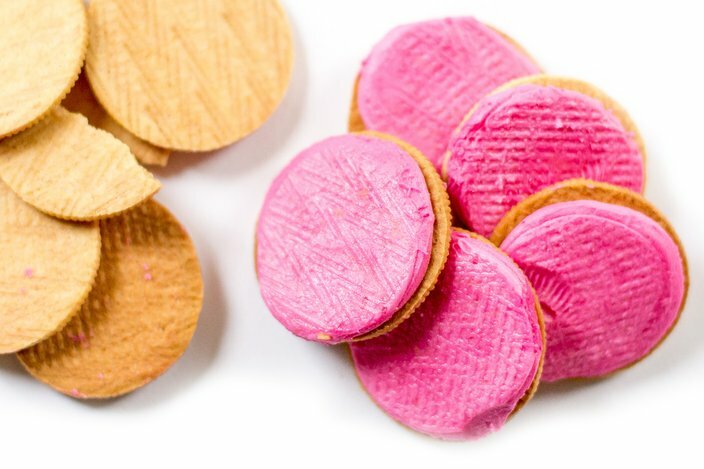 Since their debut, people have been Tweeting about the food dyes in the Peep Oreo making their poop turn pink. After eating a few cookies, my tongue and teeth did sport a noticeable shade of pink that did not easily go away. Verdict : While it doesn’t taste like a Peep, as a cookie, it’s solid. However, the pink dye leftovers in your mouth is not fun. If your poop is pink, don’t worry, it’s harmless. Probably. I am not a doctor.